If you want a true dual exit exhaust you'll either need to chop up your stock bumper or check this out! 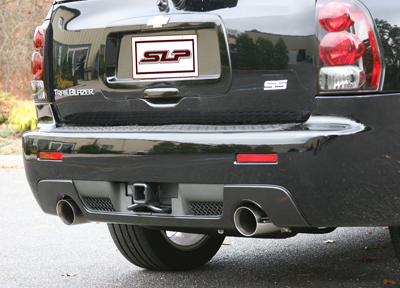 SLP rear valance for your LS2 Trailblazer SS has cut outs for both exhaust tips for the look it should have had from the factory! This rear valance has OEM quality and bolts up in minutes. Order it unpainted or have SLP paint it for you to really make things easy!